The location is great if you want to be close to the train station. The room was clean and well kept and the bed large and comfortable. Great breakfast. Nice hotel. Breakfast was excellent with the option to have eggs cooked how you wanted them. There were also lots of choices. The room was very clean and the bathroom had a bathtub! Wonderful modern hotel, great location. Breakfast was amazing! Very comfortable for people who travel by train, because a train station is 1 min by walk. VERY good room, bathroom and comfy bed. Sweet balcony and a view to Pisa Centrale. Location. It was awesome to walk across the street from the train station and drop off our luggage. We checked in at Christmas day and the staff gave us gifts (wine, pastries and cookies). The room was just the right size for the two of us and it was clean. The bed was comfortable. My family and I enjoyed our stay at this hotel. I don't have any complaints. It is very close to railway station and airport bus just outside of the hotel.You can even walk to the airport in 20-30 minutes if you don't have big luggage.Very good clean chain hotel. The price was adequate. Very nice place to be overall. Even if it is a bit far from the tower it is quiet a pleasant walk there. Pisa is surprisingly beautiful city that majority of tourists simply miss because they come directly to the tower and leave. So if you decide to stay for a day or more in Pisa having an extra 25-30 minutes walk to the tower through an picturesque main street isn't that bad because you will quickly ran out of things to do anyway. The staff was amazing. We got a wine and a very nice card for our anniversary. The hotel is incredible, very modern and nice. The room is very nice. A little small, but the bed was comfortable, the badroom very nice and clean. The breakfast was very good. The scramble eggs were a little uncooked. That can be fixed easily. One of the nicest hotel I have ever been. Some of the younger staff are very helpful, kind and hospitalble. But the older staff at the reception was quite rude and not smiling at all - she was not even smiling when we seeked help from her about NH wifi issue that was never working the whole duration of our stay. NH Pisa This rating is a reflection of how the property compares to the industry standard when it comes to price, facilities and services available. It's based on a self-evaluation by the property. Use this rating to help choose your stay! 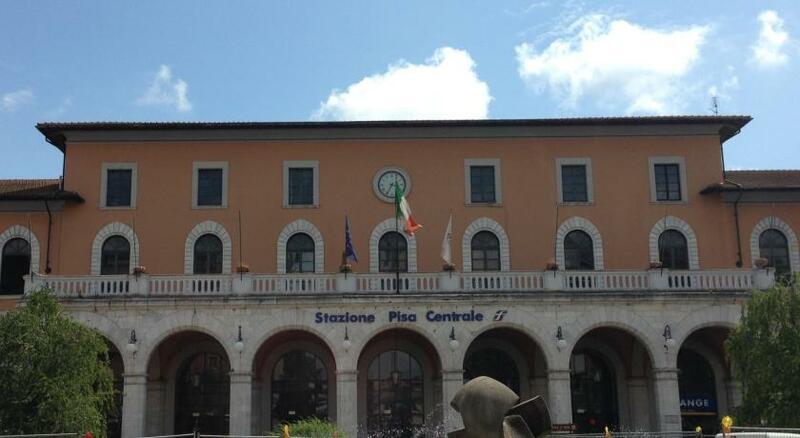 One of our top picks in Pisa.Offering free Wi-Fi, the NH Pisa is a modern building opposite Pisa Train Station. The airport shuttles stop in front of the hotel, and the Leaning Tower is just a 20-minute walk away. Rooms at the Pisa NH hotel are elegant and spacious, each equipped with air conditioning and satellite TV. Some rooms offer extra space and an LCD TV. Breakfast is a full American buffet. NH Pisa features a 24-hour front desk. When would you like to stay at NH Pisa? With views over the station's square or interior-facing views. Rooms come with carpeted or wood floors, free Wi-Fi and a bathroom with a hairdryer and toiletries. Rooms come with carpeted or wood floors, free Wi-Fi and a bathroom with a hairdryer and toiletries. This room has wooden floors and a modern design. It features an LCD TV and free Wi-Fi access. The bathroom features a hairdryer and toiletries. With views over the station's square or views on the internal courtyard. Rooms come with carpeted or wood floors, free Wi-Fi and a bathroom with a hairdryer and toiletries. Our rooms are soundproofed and have all the comforts of an international 4*. Mattresses and comfortable beds make unforgettable staying for our customers. Our breakfast includes sweet and salty products, as well as lots of traditional Tuscan delights. Moreover this hotel is ECO-FRIENDLY; certified according to ISO 14001 and 50001 standards. House Rules NH Pisa takes special requests – add in the next step! NH Pisa accepts these cards and reserves the right to temporarily hold an amount prior to arrival. The front office lady wasn't very friendly and nor very helpful to my question. The room is quite clean. Location is great, right next to train station. Dated room, dirty bathroom, no restaurant, no bar. Very noisy location. Hot room with no AC and no window you could open. Two twin beds shoved together and presented as an upgrade to a supreme room. Very unsave location that local merchants advised us to be leary of thieves. Won't be back but have enjoyed other NH hotels. The room was nothing special. For the type of room cost was very high. No kettle or tea/ coffee available in the room especially for the price you pay. Parking was great but also pricey. Beds were comfortable. Good location with shops, markets and easy walk to tower of pisa. Rooms are nice however the walls are thin you can hear conversations through the wall. Location across the road from train station, very handy when traveling on train. The hotel is perfect for a quick overnight stay in Pisa. About a 20 minute walk to the tower and there are a few nice restaurants handy to the hotel. Staff at reception were very curt and un welcoming. No explanation on what time breakfast was etc just a very generic minimum info speech . Upon check out the same generic experience. Real shame as the rest if the hotel was fine. Our bed wasn’t terribly comfortable but it wasn’t a deal breaker either. Great value and really lovely room. Would highly recommend. Didn’t seem to have a restaurant for a meal at night.